Think inside the box this gift giving season. Our 5 x 5 x 3 White Open Top Gift Box, to be specific. With this classic, sturdy container, you’ll find the perfect home for all your birthday, holiday, and wedding presents. These boxes are a sleek, tasteful way to package your gifts, and their medium size lends itself nicely to housing anything from cups and mugs to watches and bracelets. They’re even a great place to store household items, such as ornaments and knick-knacks. With an intuitive construction and a reliable tuck lid, wrapping the perfect present has never been easier. And since they’re made from a strong paperboard, you can trust them with all your gifts. 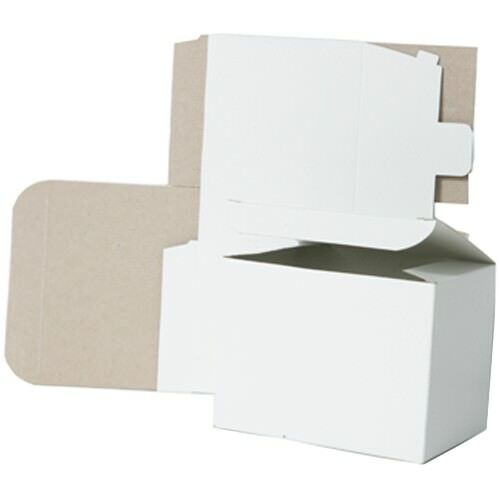 White Open Top Gift Boxes measure in at 5 x 5 x 3 inches. Sold individually or in bulk. So whether it's one person you're trying to impress or a whole bunch, these white gift boxes will certainly work in your favor. And they store flat so you won't waste any storage room!